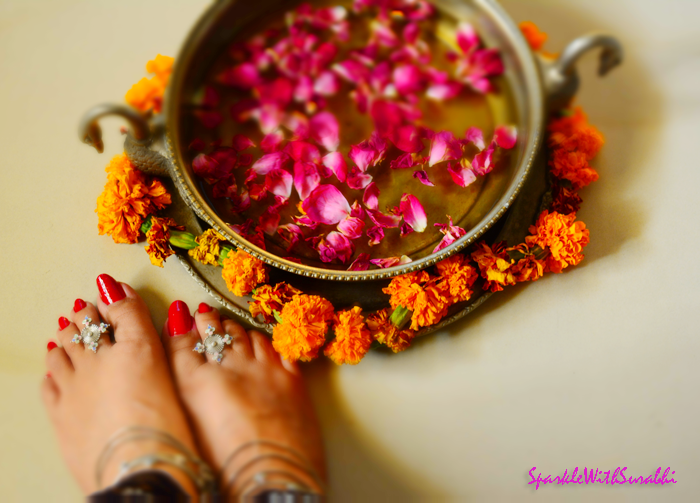 Pedicure with Roses is one of the easiest fastest way to beautify your feet on festivals. Just devote 20 minutes in your day for your feet, wear your favourite jewellery afterwards!! Amrapali jewels is a leading online shopping website for silver jewellery. I quite have a crush on their anklet collection. Buy a beautiful bowl large enough to dip your feet in, the bowl can be made out of precious metals, ashtadhatu or earthen. My favourite is earthen as it is easily available, fortunately I already had this large swan bowl as decoration piece in my home, I thought it would perfect for the perfect day like Diwali! Decorate it with marigold flowers and collect some fresh rose petals even dried roses petals work beautifully. 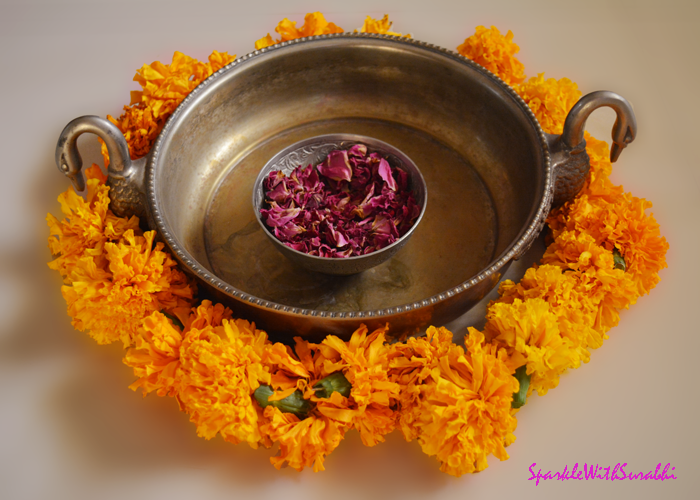 Pour water in the bowl add some rose petals also add few drops of rose Itra or rose essential oil. Dip your feet rub them nicely. Use a scrubber and lightly scrub your feet do not scrub too hard as you can end up damaging your feet. Clip of any dead skin or cuticles with a cuticle clipper. File your nails into your desired shape and apply nail paint of your choice. Wear you choice of slippers and Jewellery. Your feet are truly sublime, your divine feet should be washed with milk. Royal feet of a Royal lady.